All it takes is a short walk in San Francisco’s financial district to find undeniable proof that different generations can possess the same soul. No. It’s not Shirley McClain’s version of reincarnation. She could still be wrong about past lives returning in newborn bodies. But this brief walking tour will tell you that the spirit of San Francisco restaurant dining, alive at Tadich Grill for 150 years, now also inhabits the heart of newly-opened Wayfare Tavern just four blocks away. 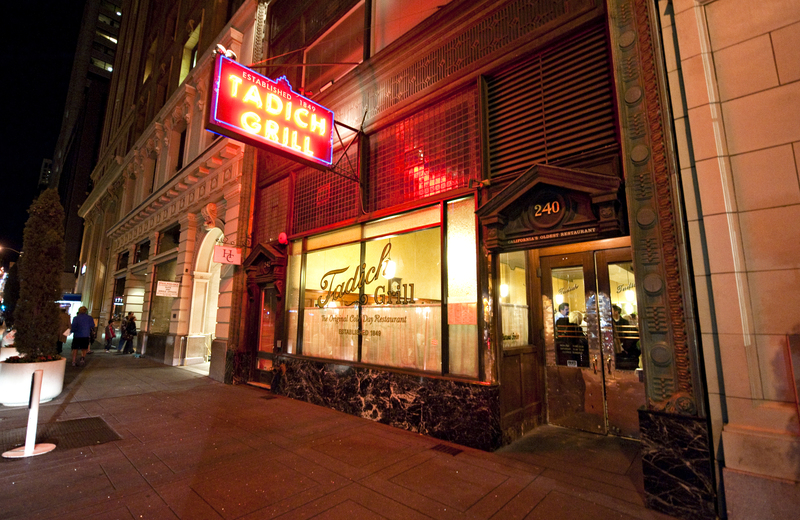 San Francisco has always cultivated what it honors – and it surely honors its dining-out tradition – which began with Tadich Grill, the city’s oldest restaurant. Starting as a coffee stand in 1849, the Tadich of today still has a gold rush era feel to it, with its old floors, wood booth interior, long bar and lunch counter and white-jacketed waiters. The instant you enter, you know this no-frills dining hall embodies the essence of San Francisco. Wayfare Tavern has its own personality, created by celebrity chef and owner Tyler Florence. But in its own way, Wayfare too brings old San Francisco back to life. The first floor of the turn-of-the-century building is dominated by a floor to ceiling brick wall with old portraits, a giant antlered animal head above a fireplace, dark leather booths and an eating bar looking into an open kitchen. Upstairs there are more dining and drinking areas and a billiard room you might find at an old gentlemen’s club. Wayfare is not your grandfather’s Tadich Grill. But in some ways, it is. Waiters wear black aprons and jeans, not the Tadich white coats. The feeling is legacy of Barbary Coast, not the original. But both places belong in any discussion of what it means to be an authentic San Francisco dining spot. Tadich boasts of being the first to broil seafood over mesquite charcoal back in the early 1920s. Then, as now, seafood dominates the menu. The classic sourdough bread, Dungeness crab cocktails and Pacific oysters start many a meal. Most of the fish comes charcoal broiled, pan-fried or sautéed. Their cioppino speaks of San Francisco tradition. The main fare at Wayfare is a celebrity chef’s take on the classics. The organic fried chicken comes with an herby, rosemary-infused crust. The classic Caesar salad is a head of baby romaine topped with a half soft-boiled egg, roasted garlic, capers and shaved Parmesan. If you like these two dishes, you will enjoy the Wayfare version of each. For dessert I had spiced pumpkin pudding cake – a soft-centered treat along the lines of molten lava cake. It was accompanied by Inverness blue cheese, honeycomb from Tyler’s backyard and toasted walnuts. I had never considered pairing blue cheese and honey. But it works. 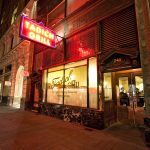 Fabled San Francisco Chronicle columnist Herb Caen once wrote that while eating Hangtown Fry (an oyster and bacon omelet dating back to the gold rush) he felt as if time stood still at Tadich Grill. No telling how he would feel if he were alive today to try the Wayfare’s version, or how he would feel about the two restaurants themselves. One transports you back to what San Francisco must have been like at the turn of the 20th century. The other takes that same era and moves it forward. But the spirit of San Francisco restaurant dining lives on at both. You can experience it by walking the four short blocks that separates the two. Tadich has long been one of our favorites in SF. It exudes the city’s tradition (along, of course with Johns of Maltese Falcon fame). While Tadich does not take reservations, the wait is good if you elbow your way to the bar and have a great martini or two. In short, good food, good service, and a taste of old San Francisco. Don’t miss it.